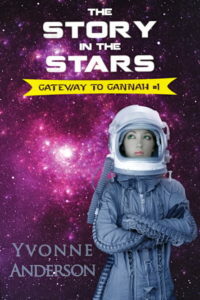 Yvonne Anderson, author of the science-fiction “Gateway to Gannah” series, shares her journey to publication in her first column as a new Speculative Faith regular contributor. I attended my first writers’ conference in 2007 as a wet-behind-the-ears newbie certain of only one thing: God had called me to write. It wasn’t much to start with, but it was enough. In the course of a series of divinely-arranged circumstances, I boarded a jet in Ohio (my first experience flying since 1975) and flew to Dallas, Texas for the annual American Christian Fiction Writers conference, ready for… I had no idea what. It was a writers’ conference, and I wanted to be a writer. That was the extent of my expectation. This occurred the day after my dad was admitted to a nursing home. He’d moved in with us in 2004 at the age of 88. For three and a half years, I’d done what I could to ease the pain of his physical and mental deterioration. I’d planned to have him stay short-term at a care facility while I was at the conference, but his condition took a sudden nosedive. A week before my scheduled trip, he was hospitalized, and it was plain that the round-the-clock care he’d require upon discharge would be more than I could provide. So we changed those temporary accommodations to permanent ones. The day before I left for the conference, he was moved from the hospital to what we all knew would be his final home on this earth. My soul wept all the way to Dallas. It was puffy and sore when I entered the hotel. Though the conference experience was wholly new, I felt no trepidation; I hurt too much. Shifting into what I hoped looked like professional-writer mode, I checked into my room, which I’d booked with three women I knew only virtually. I had never met anyone there, but I was determined to meet as many people as I could, learn as much about the business of writing as I could, and put everything else out of my mind for the weekend. I hadn’t taken into account the fact that this was an organization of Christian fiction writers. One of the first people I met was a multi-published author who’d done a paid critique of my then-WIP, The Story in the Stars. We met before the conference officially began. One of the first topics of conversation was our dads. One of the first things we did was cry and pray together before the throne of our mutual Father. I hadn’t expected that. I had no idea the conference would involve hundreds of sisters and a handful of brothers singing praises to our Lord, lifting the rafters, testifying to the employees and other hotel guests, “How great is our God! Sing with me! How great is our God!” I never anticipated meeting so many people from so many walks of life and backgrounds who were all on the same page concerning writing and faith. I didn’t know God had arranged this trip for my healing as much as my writing education. This isn’t an ad for ACFW; it’s more like an ad for God. But I don’t need to sell Him here. You read this blog because you’re already embarked on this amazing journey aboard His Majesty’s vessel Saved by Grace. 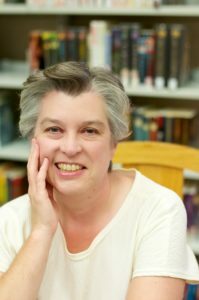 Yvonne’s columns will now appear every other Wednesday on Speculative Faith. It’s reassuring to know I’m not alone on this sea. To rub virtual shoulders with others who love fiction but can’t stomach romance novels. To hobnob with souls whose thought processes travel through a different shaped conduit, perhaps, than what carries the typical Christian current, but are no less Christ-followers. I’m thankful for the heart and hard work of the founders and keepers of this site. For the thought provocations and discussions—even diametrical disagreements—conducted with a refreshing respect and utter lack of rancor. I’m grateful to be welcomed, not as an oddity or amusing change of pace, but as one who belongs. Above all, I’m thankful to serve a King who delights in giving His children just what they need at just the right time. How great is our God—sing with me! Welcome, Yvonne. It’s always great to have a fresh voice join our conversation here. Congratulations on being a contributor! I look forward to reading your articles! I love your writing journey, but even more, I love how you greatly affected my writing journey!! Hugs! God is so amazing, isn’t he? You had no way of knowing he planned a healing for you at a writers conference. He knows what you need, even before you ask. So glad to have you on board here at Spec Faith, Yvonne. Welcome! And another welcome from my station, Yvonne. It’s great having you on the bridge of this, the Starship SpecFaith. Good intial foray, Yvonne. Thanks for sharing. Way-to-go, Yvonne! Congratulations, and we’re looking forward to future posts!